In The Politics of Autism, I write about education and the Individuals with Disabilities Education Act. 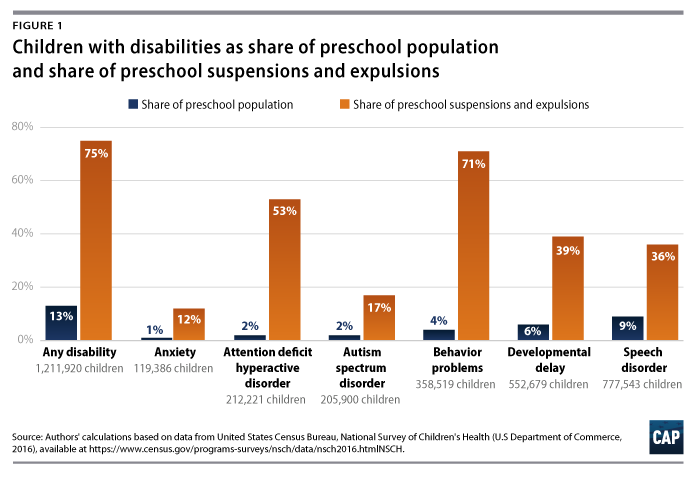 New data reveal that although children with disabilities represent a relatively small proportion of the population of children ages 3 to 5 attending preschool, they make up a disproportionately large share of suspensions and expulsions. Children with any disability or social-emotional challenge make up only 13 percent of the preschool population, but they constitute 75 percent of all early suspensions and expulsions. A similar pattern of overrepresentation can be found across all disability conditions. And preschoolers with ASD are 2 percent of the population but 17 percent of suspensions and expulsions.